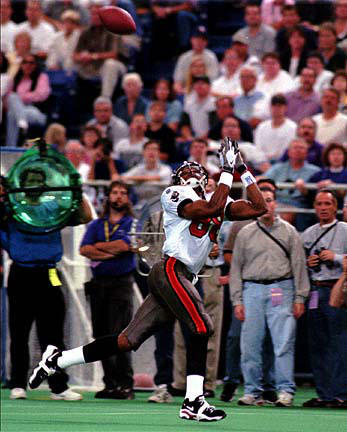 Warrick Dunn’s 101 yards led a 191-yard ground outburst. Mike Alstott scored the most memorable touchdown in Buc history, on a third-effort one-yard TD run in which he bounced off a failed dive over the middle, faked out one Viking defender and bowled backwards over two more for the score. The win was sealed when Dunn took a delayed handoff into the middle, eluded several tacklers and broke it outside for a 52-yard TD run. INDIVIDUAL STATISTICS RUSHING BUCS: Dunn 16-101, Alstott 8-29, Rhett 8-28, Anthony 1-26, Dilfer 4-7. VIKINGS: Smith 10-54, Johnson 2-16, Evans 1-4, Hoard 2-(-2). PASSING BUCS: Dilfer 20-15-192-0-2. VIKINGS: Johnson 44-29-334-0-1. RECEIVING BUCS: Anthony 4-58, Copeland 3-85, Harris 3-13, Thomas 2-26, Alstott 2-9, Dunn 1-1. VIKINGS: Reed 6-131, Carter 6-69, Smith 6-27, Evans 5-53, Walsh 2-29, Hoard 2-8, Palmer 1-10, DeLong 1-7. INTERCEPTIONS BUCS: none. VIKINGS: none. KICK RETURNS BUCS: Dunn 3-63. 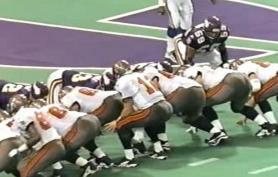 VIKINGS: Palmer 4-58. PUNT RETURNS BUCS: Dunn 3-39, Williams 0-0. VIKINGS: Team 2-14. SACKS BUCS: Ahanotu 1-11, Brooks 1-7, Jackson 0.5-3, Upshaw 0.5-3. VIKINGS: Rudd 1-7.